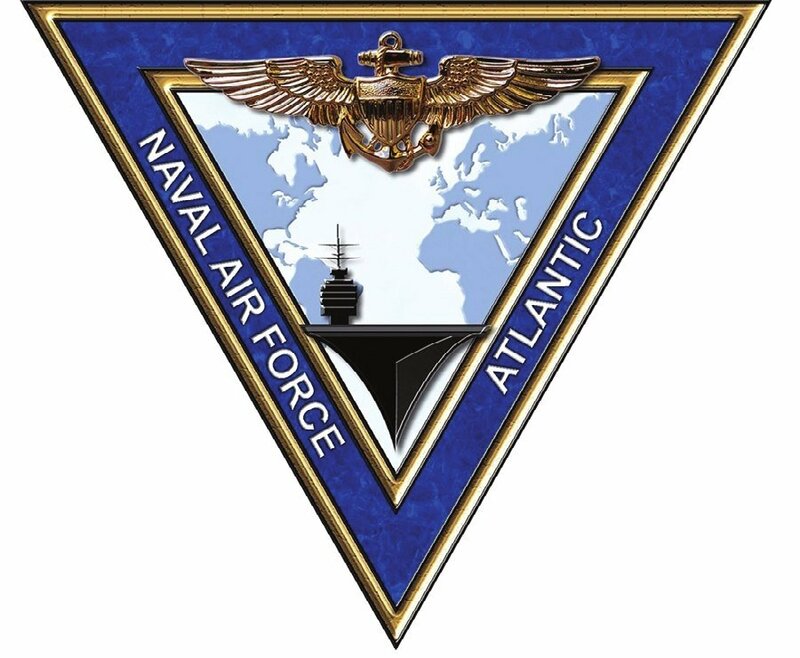 Commander Naval Air Force Atlantic (AIRLANT), one of only two aviation type commands in the Navy, is the headquarters command for all operational naval air assets on the East Coast of the United States. The command’s mission covers three categories: manning, training and equipping. Based in Norfolk, Va. more than 600 military and civilian staff members work to ensure AIRLANT’s fleet assets are prepared to deploy in response to any national security requirements or in support of Humanitarian Assistance and Disaster Response (HADR). Commanded by a Rear Admiral, AIRLANT reports to Commander, U.S. Fleet Forces (USFF). AIRLANT provides support for six aircraft carriers, four carrier air wings, a strike fighter wing, a patrol/reconnaissance group, a maritime patrol wing and two helicopter wings. Spread across these commands, are 70 squadrons, 1,200 aircraft and more than 30,000 officers, Sailors and civilians. When these forces are deployed, they support Maritime Security Operations and carry out U.S. maritime strategy by providing combatant commanders forward presence, on-call deterrence, sea control and power projection, as well as mobile humanitarian and disaster relief platforms. The aircraft carrier, with its embarked carrier air wing, is a preeminent asset for maintenance of maritime superiority across the oceans of the globe. History has time and again shown the invaluable benefits of having the capability to bring decisive air power to bear from the sea. The aircraft carrier, combined with the ships in an accompanying carrier strike group, is capable of carrying out missions across the full spectrum of military operations, ranging from large-scale combat operations to deterrence to humanitarian assistance. Aircraft carriers are flexible and adaptable, and, by design, thanks to their size and weight, they can generate a large number of aircraft sorties to deliver the payloads necessary for the achievement of various desired outcomes in furtherance of national military objectives. Built on the legacy of both today’s Nimitz-class aircraft carriers and the investments the U.S. Navy has made since World War II, the Ford-class carrier will be the most advanced ship on the sea, ensuring that the Navy remains a ready and resilient force for the future. Aircraft carriers provide a wide range of flexible mission capabilities to include maritime security operations, expeditionary power projection, forward naval presence, crisis response, sea control, deterrence, counter-terrorism, information operations and security cooperation. The ship’s embarked air wing is capable of projecting tactical air power over the sea and inland, as well as providing sea based air, surface and subsurface defense capabilities. Sailors aboard the aircraft carrier USS Harry S. Truman (CVN 75) man the rails during departure for deployment. 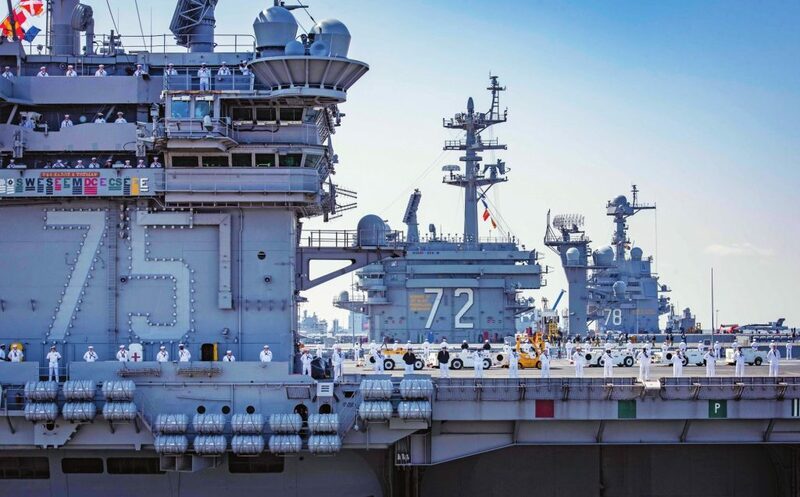 Behind the Truman are aircraft carriers: USS Abraham Lincoln (CVN 72) and USS Gerald R. Ford (CVN 78).